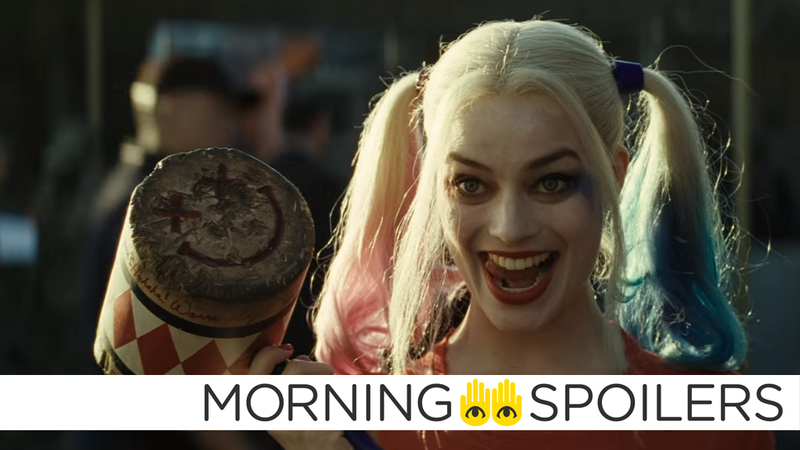 Could There Be Even More Batman In Suicide Squad Than We Thought? Anthony Russo teases a major sequence for Tony Stark in Civil War. The Kingsman sequel may have landed a crazy new cast member. Sophie Turner teases Sansa's vengeance in Game of Thrones. Plus, an update from Finn Jones on Iron Fist, details on Rogue One's big cameo role and more on The Vampire Diaries' future. Spoilers now! Flickering Myth reports that actor Spencer Wilding — who has done stunt work for Guardians of the Galaxy and Batman Begins, as well as playing several creatures on Doctor Who — will play Darth Vader's physical presence in the film. They add that Wilding has been providing dialogue on set, indicating that Vader's presence will be a speaking role (presumably with James Earl Jones providing vocals). I mean, this movie has a very remarkable sequence I think where Robert Downey Jr. plays a 20-year-old man, which is pretty incredible. He plays someone who is around the age he was when we first saw him on the screen. It took us months and months of work on that shot to make it work. It's just very complicated taking the human face and changing the human face in a way that looks realistic. In fact, it was the last shot we completed in the movie. We just dropped it into the movie maybe five days ago. John Krasinski is in early talks to join the film's cast, according to Variety. I can't say [what genre], but certainly we are in early days now of working on it. Paul Rudd is working on that story as we speak with Peyton Reed. We certainly want to stay true to what made it so unique and different, and we'll see how that comes together. The Hollywood Reporter, err, reports that Elton John is close to joining the film's cast in an undisclosed role — it's unconfirmed whether he would be playing himself, or a fictional character. That's a good point. We don't get an element of surprise. Everyone knows he's coming, and yet he hasn't had terribly many scenes that have illuminated very much about him. You can count on a lot of scenes where we illuminate a lot about him very early. Here is, somehow, a third trailer for the Angry Birds movie. All of this injustice has happened to her the past five seasons. Now it's about her getting revenge on people who have completely destroyed her life right from the beginning. [Season 6] is about her — step by step — trying to eliminate the enemy. I love the character. What really drew me was the character and the story. I really enjoy how he's a superhero with a real heart but has spiritual elements as well. I think it's going to be an exciting character to play because there's this contraction of on one hand he's from a very wealthy family, he's a billionaire, on the other hand he's been in this world of K'un-Lun for a long time where he's learned kung fu and buddhist philosophy. There's a contradiction in those elements that's going to be really fun to play. Executive producer Julie Plec discusses the show's future — although TV Line notes that these comments were made before Ian Somerhalder's recent comments that the show will end with its eighth season. I'm going to be dead honest with you: I was so happy to get Season 8 that even the idea of Season 9 is so far away — I haven't even started thinking about it. I know Kat [Graham] made her announcement; I wish her everything she wants, and she can stay as long as she wants. David Anders and Robert Buckley discuss Blaine and Major's evolution throughout the second season in a new interview with Comic Book Resources. Finally, here's a new promo for the show's return.